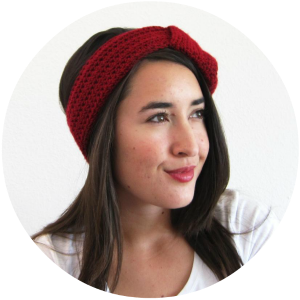 I have a new crochet pattern for you today! This week's 10 for Tuesday was all about crocheted baskets. It inspired me to create my own version. I knew I wanted the base to have an oval shape and for it to have handles. I used a cotton yarn I had in my stash (I'm still staying true to my March goals!). The great thing about this yarn was that I had picked it up on clearance awhile ago so it was just $0.97 a ball. That means I made myself a crochet basket for about $2! This pattern is worked up with 2 strands of yarn held together. It's pretty sturdy on its own, but you can always add fabric stiffener or go down a hook size if you want a denser basket. The first row of the sides of the basket (row 9) is a bit tricky to explain. I have included pictures below, but let me know in the comments if it isn't clear enough. You're basically crocheting through two rows of stitches to create a sturdier base. First through the middle of a row of slip stitches, then through the half double crochet row below. Your hook should slide easily through both rows. The finished basket is approximately 8.5" x 6" wide and 7" tall. NOTE: Try to keep the row joins in the middle of the work. You can do this by shifting your stitches if your work starts to drift to the side. This will help keep the handles centered on the basket. With yarn held double, ch 11. If you make your own crochet basket, tag me on social media (links in sidebar) because I'd love to your work! Found you on craftgawker.. Adorable. I don't knit, but if I did I would make this for sure! I wonder if you could help...I'm just wondering how to shift my stitches? When I am continuing my rows, my join is moving to the right. Thanks Sally! To shift my rows, I would alternate starting my first stitch in the next stitch (the regular way) or starting my stitches in the slip stitch from the previous row (make sure to keep the same number of stitches). This helps keep the stitches straight because every other row is slanting in opposite directions. Hi, That video is no longer viewable. I'm trying to find another one to explain 'shift stitching.' Thank you. how big is this basket?!? The oval base is 8.5" x 6" and it is 7" high. I didn't realize I left out this information (oops!). Thanks for the heads up and I'll add the dimensions to pattern. Well, I made my first basket! Made it with Lopi. I am in a Nursing Home, recovering from a stroke. I am 82 (83 on August 9th) and since I have no way to shop (and am currently wheelchair bound), I plan to make one for each of my children for Christmas--that's four. Can't do one for each Grandchild (nine) but should be able to make four. Next one will be red and white for oldest son and wife. Their daughter graduates from RPI next June and college colors are red and white. Now to my question: What do I use for lining? I want to line them. When my daughter returns from Colorado, I will send her out to get lining material. Thanks so much for the pattern; it has helped with recovery of my right hand and provided a present for each of my children. I am happy to hear you're enjoying my pattern! The baskets will make nice presents. I personally haven't lined any of my baskets, so I'm not sure what would be best. I would try cotton quilting fabric though, since it would be easy to work with and there are plenty of colors and patterns available. I wish you the best of luck on your recovery! How many skeins would you say this holds? It would really depend on the size of your skeins. As written with the hook size and yarn that I used, it would easily hold 4 skeins of Caron's SImply Soft (that is the yarn in the basket in the pictures), with space for maybe 1 or 2 more. 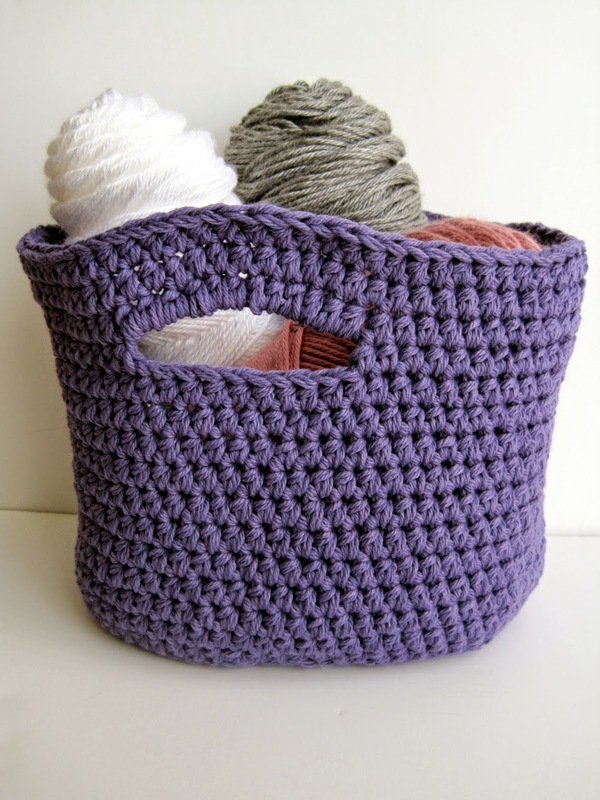 If you wished to have a bigger basket, you could continue the increase pattern for the base after row 7 or simply use a thicker yarn and larger crochet hook.